GLORY 65 takes place at Central Studios in Utrecht, Netherlands on May 17. Kickboxing event is headlined by a pair of title bouts in the middleweight and lightweight classes. Alex Pereira defends his strap against former champion Jason Wilnis, and Sitthichai Sitsongpeenong defends his belt against Marat Grigorian (respectively). Three additional matchups were added to the fight card late last week. 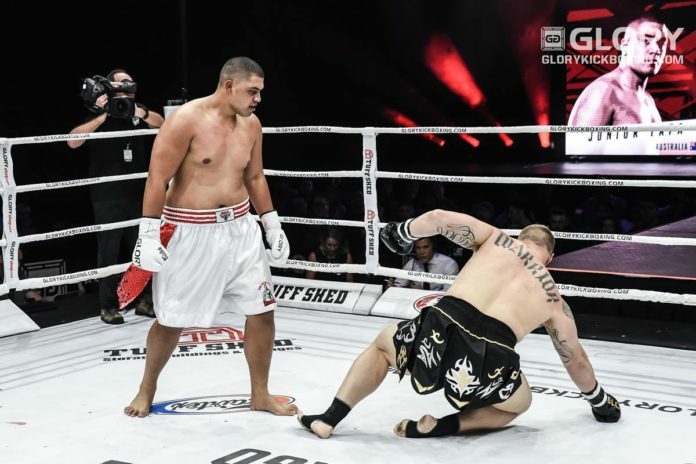 The scheduled for three rounds heavyweight kickboxing battle between Australian-Samoan Junior Tafa and Turkish Cihad Kepenek was announced on Wednesday. In his previous bout last December Tafa was stopped by Jamal Ben Saddik in the first round. Before that “The Juggernaut” himself scored a pair of victories by knockout in the first round against Haze Wilson and Anthony McDonald. He currently holds the fifth rank in the heavyweight class. Kepenek was last seen inside the ring of GLORY Kickboxing in April 2016. Making his promotional debut he suffered the defeat against “Slovakian Giant” Tomas Mozny, who took a unanimous decision. It is yet to be announced on which part of the GLORY 65 fight card the bout between Tafa and Kepenek is presented. More information and other matchups are expected to be announced shortly. The current lineup can be found below.